The first two eggs hatched on April 26, 2016, right on schedule, 30 days from the date of the last egg laid. 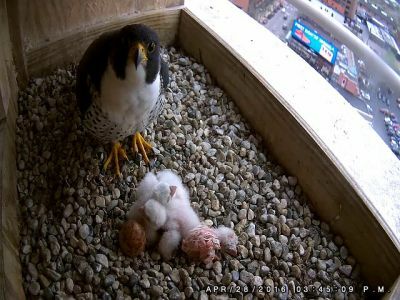 The third egg hatched on April 27, and the last egg hatched today (April 28) shortly after 3 PM. A couple hours after hatching, Rebecca returned to the nest to relive Kewpee who had been brooding the chicks. The newborn was on his back, moving his legs, but not under the warm feathers of Dad. Although Kewpee was attentive to the newborn and touched his legs and feet, he did not move the chick or himself. Rebecca promptly picked the newborn up by the side of his beak and carried him to the other side of the box, settled herself over the other chicks and then tucked the newborn under her. The chicks that hatch first always have a head start, but this year is less than last year. Last year, the hatching dates were spread over 4 days (May 4 to 7) rather than this year’s spread of 3 days.